Hosting a baby shower for a friend or colleague can be fun, but there is no denying it, these events can be expensive. Save a bit of cash by downloading one of the many free baby shower invitations available on the internet. This nautical themed printable is perfect for the mom-to-be who loves the ocean. The invitation features a sailboat floating on waves with little pink hearts sailing in the breeze. So cute! This invitation is just stunning. Pink watercolor roses surround the edge of the invitation and look almost as if they are hand painted instead of printed. This type of invitation is very feminine and would also work well for bridal showers as well as baby showers. Lions, giraffes, and zebras are just some of the animals on this adorable invitation printable. It is a perfect invitation theme for when the gender of the baby is not known. The cute jungle theme is ideal for either a baby boy or girl. Some people like their baby shower invitations to show a bit of sophistication. This gorgeous printable is that and more. Arrows and feathers adorn an elegant brown background giving this invitation a luxurious contemporary style. Who doesn't love a teddy bear theme? This invitation will bring a smile to everyone who receives one. Continue with the teddy bear theme with your decorations, and you will have the most charming party atmosphere ever. Your guests will love it! Why not have a whale themed baby shower? Start with this invitation and continue with the whale theme for the party decor. Whales are very trendy, believe it or not, and will give your party some pizzazz. If you don't mind a bit of DIY, a cactus flower baby shower invitation would be a unique and treasured keepsake. The insert is printable, and the cactus cutout is made with a digital die cutter. Everyone will love this adorable blue elephant invitation with a creme colored background. Such a sweet way to welcome a baby boy. Pretty pink polka dots and baby laundry hanging from a clothesline clipart make a sweet shower invitation. How to Nest for Less offers a complete party kit with this theme. Just download and print cupcake toppers, a banner, a party game, and an invitation–all for free with this design. Party planning doesn't get easier! Simple balloons with a "ready to pop" theme are so cute. Women who have been pregnant certainly understand that feeling pregnant women have when they are huge and super ready to be done with their pregnancies. Use a pretty floral wreath invitation to celebrate someone who is expecting a baby girl. Emmy also offers a generic version of the wreath template suitable for other types of occasions too. Almost all people love little woodland creatures. A watercolor fox is a perfect theme to celebrate the arrival of a little one. Big, bold graphic lettering draws your eye to the center of the card. A simple but elegant way to design a baby shower invitation. This brightly colored printable has a banner on top and bold polka dots on the bottom. The design is cute and simple, but also quite pretty! Although the background of this invitation is blue, it is gender neutral. Every baby is a star whether they are a boy or girl! 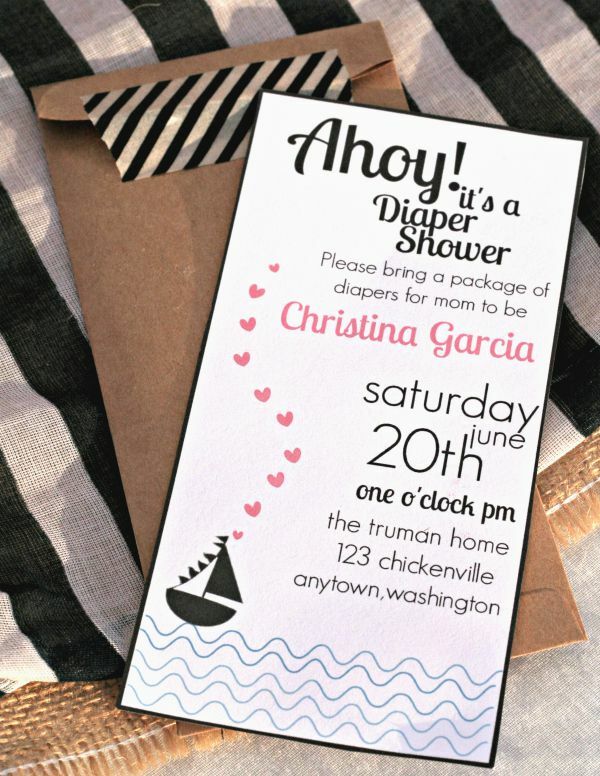 Not a fan of "cutesy" baby shower invitations? Download this simple watercolor circle with cursive writing invitation. Very simple and elegant. Are you looking for a simple card? This invitation just has pink polka dots as the background. This simple design will go well with any party theme. There is a blue version for boys available for download as well. Twins are a special blessing! Send your shower guests this cute twin themed invitation. Two adorable twin characters are featured against a gender-neutral purple background. Send out a chalkboard baby shower printable invitation to your party guests and get ready for the compliments. They will think these cards are the loveliest invitations ever. A simple floral watercolor wreath is sometimes all you need to welcome your baby boy or girl. The Nesting Spot offers three variations of the design for free download. Is the mother to be having twins or maybe even triplets? DIY Network offers unique poker themed baby shower twin printables. A simple, colorful baby shower printable that can be used for either a baby boy or girl. This invitation has a timeless design that will be suitable for years to come. This vintage style baby shower invitation features the cutest baby lamb. Cupcake toppers are also available in the printable set. This celestially themed baby shower printable is perfect for those looking for a sweet, simple hand-drawn invitation. Pampers offer a variety of free printable baby shower party kits. The kit provides free stroller themed invitations, banner, diaper raffle, party favor bag, and a thank you card. What a great way to decorate your party inexpensively!